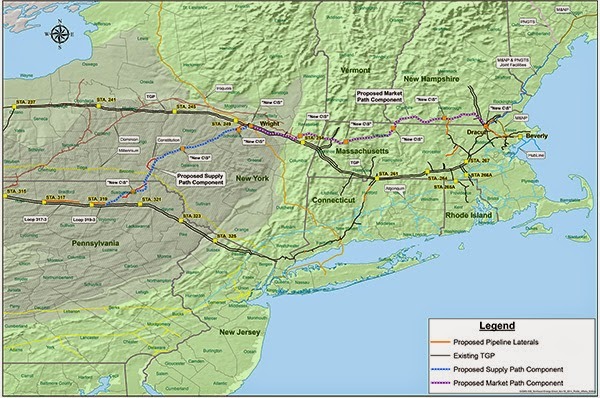 With the proposed Constitution Pipeline closer to securing final approval, after having received the Federal Energy Regulatory Commission's blessing in December, there have been fears that additional pipeline companies are eyeing a similar path through New York. Fears that were confirmed when Kinder-Morgan Company, which owns Tennessee Gas, announced its North East Direct Project to help meet increased demand for energy. Kinder-Morgan's proposed pipeline mirrors that of Constitution's natural gas route from Susquehanna County, Pennsylvania to the Schoharie County township of Wright. Activists and public officials long opposed to Constitution have balked at the placement of another pipeline through Upstate New York's rural communities, with the Schoharie County Board of Supervisors signaling its opposition to the North East Direct Project's construction in a resolution passed last fall. Opposition that gained the support of State Assemblyman Peter Lopez (R-Schoharie) on Monday afternoon. Stating that "The proposal being advanced by Kinder-Morgan suffers from poor timing and even poorer judgment," Assemblyman Lopez believes the company is at best simply insensitive to the existing concerns of municipalities divided over Constitution, or at worst is trying to "simply roll over our small rural communities." The Assemblyman's comments came on the eve of a series of public outreach sessions coordinated by Kinder-Morgan along the proposed North East Direct Project's route; the first of which was hosted last evening in Schoharie. Pleased that Lopez has "changed his mind about pipelines because we as a county really can't have a huge impact without the assistance of higher elected officials," Blenheim Town Supervisor Shawn Smith is hopeful that the state representative "actually follows through and teams up with the county on the issue." Kinder-Morgan has seven additional public outreach sessions scheduled over the next nine days, with one slated to take place at the Radez Elementary School in Richmondville on Tuesday, April 14th from 6:00-8:00 p.m. Concerned with the apparent gross duplication of the route already approved by FERC officials, Assemblyman Lopez concluded: "Our region has been exhausted by floods, the recession, and the existing controversy surrounding the recently federally approved Constitution Pipeline. We do not need any further disruptions. The residents and business owners have been through enough. The region needs to move forward, heal, and rebuild. I do not support the Kinder-Morgan/Tennessee Gas Proposal." Should I say better late than never. Pete we needed you 3 years ago when constitution came calling. You should also have been in opposition to constitution and their unethical, immoral, and what I call criminal acts against your constituents. You should be against eminent domain in any way, shape, or form. In your press release you stated the timing of the open houses were suspiciously planned around the traditional Easter / Passover vacation. That is what these big companies do. It was constitution who was serving papers Christmas week telling us they will be confiscating our land, all part of their bullying tactics. I hope your sincere in your opposition and not just doing this for your own political benefit. What was I thinking of course your not being sincere. I forgot for a minute your good friend and the man you learned the political game from John Faso has been a paid mouthpiece for constitution pipeline. I hear both of you are contemplating a run for Congress, I'm sure constitution will be donating a large sum to the Republican nominee. That's how the political game works.